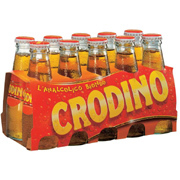 Crodino is the most widely available non-alcoholic drink and one you can't really go wrong with. It is produced in Piedmont and gets its distinctive taste from an extract drawn from a mix of infusion and distillated herbs, plants and fruit pieces. The exact ingredients and measures are, it goes without saying, a well-kept secret. Widely available in Italy this is a non-alcoholic aperitif, made from an infusion of herbs, plants and fruit. Delicious and crying out to be experimented with in cocktails.